RISING NRL superstar Gideon Gela-Mosby could find himself at the centre of a representative tug of war next week as PNG Kumuls officials consider whether to hand the 20-year-old a shock international debut. The Cowboys speedster, who has been named in the Queensland Residents team to play NSW Residents on May 7, grew up on Darnley Island in the Torres Strait but could be eligible for the Kumuls through his parents’ links to Daru Island, 1.3km off the coast of Papua New Guinea. Gela-Mosby has told PNG selectors of his desire to represent the Kumuls and is an outside chance of cracking the national team for their Test against the Cook Islands. The only sticking point is whether he can prove his eligibility to the international body. 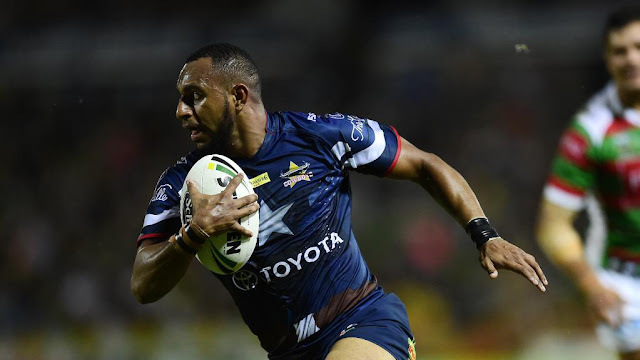 The Northern Pride winger will have the ideal chance to impress this weekend when he travels to Port Moresby for an Intrust Super Cup match ­tomorrow against PNG Hunters. The Kumuls might not need him due to a wealth of experienced backline talent, with incumbents including Cairns Brothers junior Nene Macdonald, Broncos winger David Mead, Melbourne Storm-contracted Justin Olam and Hunters wingers Stargroth Amean and Adex Wera. PNG trainer and Kangaroos junior coaching co-ordinator David Westley, a former Kumuls representative, said Gela-Mosby was certainly in the minds of selectors, who are likely to include him in their squad for the 2017 Rugby League World Cup. “They’ll have a look at him for sure when he’s up there,” he said. If he misses out on a Pacific Test call-up or is ruled ineligible, Gela-Mosby will play for the Queensland Residents alongside his Pride and Cowboys teammate Ben Spina. It will be the fourth appearance for the 29-year-old prop, who played in 2012, 2013, was selected then withdrew in 2014 after being called up to make his NRL debut, then captained the side in 2015. Northern Pride coach Ty Williams congratulated both players on their selection, but felt Will Bugden was unlucky to miss out on the 18-man squad featuring 11 NRL-contracted players. ■ Meanwhile, Williams has been forced into several changes to his initial squad to take on the PNG Hunters tomorrow. Mareeba junior Ben Hampton has been called back to the Cowboys and is expected to play in tonight’s NRL game against the Eels, while Bradley Stephen (shoulder) and Sheldon Powe-Hobbs (broken thumb) have been ruled out with injury. Backrower Graham Clark will play in place of Stephen, who could be back for Round 10 match in a fortnight.